(D) said fraction having a number average molecular weight Y calculated from the equation: Y= -293+106.004·X    wherein X is the amount (in % based on said fraction) of glucose residues having both 1→ 4 and 1→ 6 glycosidic linkages as quantitatively determined by "Hakomori's methylation method," said calculated value Y being in the range of variations of up to 20% from the number average molecular weight as actually measured, (E) the ratio of the weight average molecular weight of said fraction to the number average molecular weight thereof being at least 25:1. The present invention relates to indigestible dextrins which are prepared by heat-treating potato starch with addition of an acid and hydrolyzing the resulting starch with alpha-amylase and glucoamylase and which contain dietary fiber and have a low caloric value. Pyrodextrins are prepared by heating a starch containing several percent of water in the presence or absence of acid. These dextrins include British gum which is obtained by heating the starch at 135 to 218°C in the absence of acid for 10 to 20 hours, white dextrin which is prepared by heating the starch at 79 to 121°C in the presence of acid for 3 to 8 hours, and yellow dextrin which is prepared similarly by heating the starch at 150 to 220°C with addition of acid for 6 to 18 hours. It is known that these dextrins are consisted of glucose, the component of starch, which consists primarily of 1→ 4 and 1→ 6 glycosidic linkages and contains very small amounts of 1→ 3 and 1→ 2 glycosidic linkages. The proportions of these glycosidic linkages are disclosed only in J.D. Geerdes et al., J. Am. Chem. Soc., Vol. 79, 4209(1957), G.M. Christensen et al., J. Am. Chem. Soc., Vol. 79, 4492(1957) and the literature mentioned below. Methylation analysis of pyrodextrin obtained by heat-treating commercial corn starch with addition of hydrochloric acid reveals that the pyrodextrin comprises at least 57.3% of 1→ 4 glycosidic linkage fraction (2,3,6-Tri -O-Methyl-D-glucose), 2.6% of 1→ 6 glycosidic linkage fraction (2,3,4-Tri-O-Methyl-D-glucose), up to 1.2% of 1→ 3 glycosidic linkage fraction (2,4,6-Tri-O-Methyl-D-glucose), 6.3% of a fraction having both 1→ 4 and 1→ 6 linkages (2,3-Di-O-Methyl-D-glucose) and about 20% of a fraction having other glycosidic linkages. Further R.L. Whistler and E.F. Paschall, Starch Chemistry & Technology, Vol. 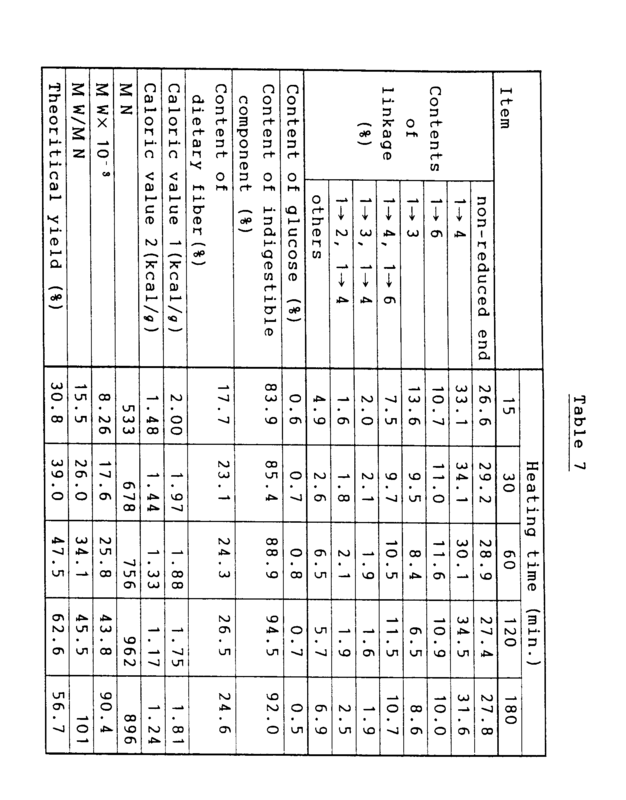 1, 430(1965) makes reference to analyzed values of linkage types constituting heat-treated amylopectin and heat-treated amylose which were obtained by separating corn starch into amylopectin and amylose fractions and individually heating the fractions with addition of an acid. The analyzed values were obtained for the heat-treated fractions which were prepared by gelatinizing the starch, then separating the starch into the two fractions and heating the fractions. The form of powder heat-treated therefore differs from that of natural starch, so that the values can not be used directly for comparison. However, in view of the fact that the ratio between the two fractions of usual corn starch is about 8:2, the analyzed values, when calculated for corn starch, correspond to 67% of 1→ 4 glycosidic linkage fraction (2,3,6-Tri-O-Methyl-D-glucose), 2.7% of 1→ 3 glycosidic linkage fraction (2,4,6-Tri-O-Methyl-D-glucose) and 7.8% of a fraction having both 1→ 4 and 1→ 6 glycosidic linkages (2,3 Di-O-Methyl-D-glucose). Tomasik, P. and Wiejak, S., Advance in Carbohydrate Chemistry, Vol. 47, 279-343(1990) generally describes the latest information as to processes for preparing pyrodextrins. When analyzed, however, any of commercial pyrodextrins was found to be up to 30% in indigestible content, up to 3% in dietary fiber content, at least 3.1 kcal/g in caloric value 1 and at least 3.1 kcal/g in caloric value 2. When starch was heated under altered conditions to increase these contents, it was possible to increase the indigestible content to about 60% and the dietary fiber content to about 30% and to decrease the caloric value 1 to about 2.7 kcal/g and the caloric value 2 to about 2 kcal/g, whereas the product then contained an increased amount of colored substance, had a stimulative odor, therefore required refining and was not practically useful because of extreme difficulties encountered in refining the product. Accordingly, it is impossible to obtain a dextrin which is at least 75% in indigestible content, at least 20% in dietary fiber content, up to 2.6 kcal/g in caloric value 1 and up to 2 kcal/g in caloric value 2 as contemplated by the present invention. With respect to the enzymic hydrolysis of pyrodextrins, B. Brimhall, Ind. Eng. Chem., 36, 72(1944) discloses that when so-called British gum prepared by heating starch in the absence of acid is hydrolyzed with alpha-amylase, the limit of decomposition is 3.5% calculated as maltose, i.e., about 7.4 calculated as DE. Further U.S. Patent No. 3,974,032 discloses a hydrolyzate which is prepared from a pyrodextrin obtained with addition of hydrochloric acid and having a degree of branching of 7 to 16% by hydrolyzing the pyrodextrin at 60 to 85°C to DE of 9 to 20 with alpha-amylase and which is up to 20 in the ratio of weight average molecular weight to number average molecular weight and contains up to 20% of oligosaccharides having a degree of polymerization of 200. However, the patent discloses nothing about hydrolysis with glucoamylase or about dietary fiber. With improvements in living standards in Japan in recent years, eating habits have changed and become similar to those of American and European people. This trend has resulted in a lengthened average life span and a rapidly aging society with marked increases in degenerative diseases. Manifestly, people have become health-oriented. Attention has, therefore, been directed to dietary fibers and oligosaccharides enhance the function of foods and livestock feeds in that these materials are known to alleviate constipation and other desired biological regulatory functions. Indigestible substances, such as dietary fibers and oligosaccharides, exhibit various modes of behavior in the digestive tracts producing physiological effects on the living body. First in the upper digestive tract, water-soluble dietary fibers slow the transport of food and delay the absorption of nutrients. Delayed absorption of sugar, for example, suppresses the rise in blood sugar value, consequently lowering insulin requirements. Further, excretion of bile acid is promoted, diminishing the sterol group in the body lowering the cholesterol level of the serum. Other physiological effects through the endocrine system of the body are also reported. Another feature of these indigestible substances is they are not digested or absorbed by the digestive tract, including the small intestine and reach the large intestine. On reaching the large intestine, oligosaccharides and dietary fibers are partly acted on by enterobacteria yielding short-chain fatty acids, intestinal gases, vitamins, etc. Acidification of the intestinal environment by the short-chain fatty acids condition the intestine. It has also been reported that when absorbed, these short-chain fatty acids are metabolized to provide energy and, simultaneously, inhibit the synthesis of cholesterol. Therefore, ingestible substances are necessary in obtaining these desired physiological effects. A "dietary fiber hypothesis" suggested by Trowell and Burkitt epidemiologically revealed that there is a negative correlation between the intake of dietary fibers and the onset of non-infectious diseases such as cholelithiasis, ischemic heart diseases, cancer of the large intestine, etc. Thus, insufficient ingestion of dietary fibers is thought to be a cause of degenerative diseases which are said to be diseases of the Western type. The dietary fibers are defined as the "whole group of indigestible components of foods which are not digestible by human digestive enzymes" and are classified into insoluble dietary fibers and water-soluble dietary fibers according to the solubility in water. Of these, water-soluble dietary fibers have attracted attention as materials for functional foods and livestock feeds because of their great physiological function. For example, it is said that high viscosities inhibit diffusion of sugar, resulting in delayed absorption of sugar and reduction in the rise of blood sugar value, consequently lowering insulin necessity. Further it is said that promoted excretion of bile acid into feces by water-soluble dietary fibers diminishes cholesterol in the serum, and that after reaching the large intestine, the dietary fibers are acted on by enterobacteria to produce lactic acid and acetic acid with these organic acids lowering the pH within the large intestine and preventing cancer of the large intestine. Examples of such water-soluble dietary fibers include guar gum, glucomannan, pectin and like natural gums which have high viscosity which are difficult to ingest singly in a large amount. Further the addition of these fibers to processed foods encounters problems in preparing the food and presents difficulties with respect to texture. It has therefore long been desired to provide dietary fibers of low viscosity which have the same physiological functions as the above fibers, are easy to ingest and are user-friendly in preparing processed foods. In recent years in Japan, processed foods, precooked foods, fast foods and the like have found wider use with the maturity of economical environments and the resulting improvements in food processing techniques and distribution techniques. With this trend, diversified information as to the ingestion of foods has become available, and eating habits to fulfill the nutrient requirements are changing to health-oriented dietary habits contemplated for the prevention of nutrition disorders and degenerative diseases due to eating habits. Especially, people of middle or advanced age and young women have much need for low caloric foods, so that low caloric sweeteners and bulking agents for strong sweetening agents have been developed. Among these, low caloric sweeteners include various indigestible oligosaccharides and sugar alcohols, which nevertheless have many problems with respect to the quality, degree of sweetness, oligosaccharide content and likelihood of causing laxation. The bulking agent available for use with strong sweetening agents such as aspartame is polydextrose only, whereas polydextrose is ingestible in a limited amount, tastes bitter in an acid condition, is hygroscopic and therefore has problems. In view of the situation described, it has been desired to provide a low caloric bulking agent which fulfills the requirements for use as a food and which is usable for sweeteners and the like with safety. On the other hand, starch is used in large quantities in various processed foods as a food material. Useful food materials of these types include starch and starch products such as pregelatinized starch, pyrodextrin, derivatives, glucose, corn syrup solids and maltodextrin. However, a majority of these starch products are not higher than 5% in the content of indigestible component and at least 3.9 kcal/g in caloric value, so that among starches and like materials, only pyrodextrin appears useful as a dietary fiber and low caloric material. Heat-treated starch (pyrodextrin) will hereinafter be referred to merely as "dextrin". Accordingly, the main object of the present invention is to provide a novel indigestible dextrin which is diminished in the amount of colored substance and stimulative odor and which contains at least 37% of an indigestible component and at least 7.8% of dietary fiber and is up to about 3.1 kcal/g in caloric value 1 and up to about 2.9 kcal/g in caloric value 2. Preferably, the portion of the dextrin other than glucose contains at least about 80% of an indigestible component and at least about 8% of dietary fiber and is up to 2 kcal/g in caloric value 1 and up to 1.5 kcal/g in caloric value 2. The term "dextrin" used merely as such hereinafter means a heat-treated starch (pyrodextrin). We conducted research on processes for preparing dextrins, hydrolysis processes and processes for preparing indigestible dextrins from dextrins. Based on the results obtained, we filed a patent application for an invention entitled "Process for Preparing Indigestible Dextrin." Our research subsequently carried out on the physiological activities of this dextrin revealed that the dextrin had an intestine conditioning effect, effect to ameliorating hypercholesterolemia, effect to lower insulin requirements, hypotensive effect and low caloric value, i.e., effects similar to those of dietary fibers. Based on the finding, we filed a patent application for the dextrin as a food composition. We have also investigated the correlation of the structure of the dextrin with the content of indigestible component or dietary fiber and with the caloric value thereof, and found that the contents of indigestible component and dietary fiber of the dextrin are in inverse proportion to the amount of 1→ 4 glycosidic linkages in the dextrin among other glycosidic linkages therein, and that the caloric value is in proportion to the amount of 1→ 4 glycosidic linkages in pyrodextrin among other glycosidic linkages therein. We have further conducted detailed research. The research thus conducted on various pyrodextrins indicates that the contents of indigestible component and dietary fiber and the caloric value are closely related with the amounts of glycosidic linkages such as 1→ 4 glycosidic linkages and with the average molecular weight of the dextrin, consequently affording equations representing high degrees of correlation by statistical numerical analysis. However, the commercial pyrodextrins obtained by the prior art are as low as 5 to 30% in the content of indigestible component and 3 to 12% in dietary fiber content and as high as 3.3 to 3.9 kcal/g in caloric value 1 and 3.1 to 3.85 kcal/g in caloric value 2. Although attempts are made to produce an improved pyrodextrin by a longer period of reaction at a high temperature, the product contains a colored substance, releases a stimulative odor and is in no way practically useful. We have further conducted research to give increased contents of indigestible component and dietary fiber and found the following. 1) When pyrodextrin is hydrolyzed with alpha-amylase and glucoamylase, the resulting glucose and monosaccharides (which consist primarily of glucose and will therefore be referred to as "glucose" hereinafter) can be substantially separated off by ion exchange resin chromatography. 2) When at least one-half of digestible glucose is removed from the hydrolyzate to obtain an indigestible fraction, the fraction contains at least 37% of an indigestible component and at least about 8% of dietary fiber and is up to 2 kcal/g in caloric value 1 and up to about 2.9 kcal/g in caloric value 2. 3) When a greater proportion of glucose is removed from the hydrolyzate to obtain an indigestible fraction, the fraction contains at least 80% of an indigestible component and at least 18% of dietary fiber and is up to 2 kcal/g in caloric value 1 and up to about 1.5 kcal/g in caloric value 2. 4) When disaccharides and oligosaccharides are removed from the hydrolyzate along with glucose, the resulting dextrin can be given a still higher dietary fiber content. The present invention has been accomplished based on these novel findings. Accordingly, the foregoing object of the present invention can be fulfilled by determining the structural requirement of the pyrodextrin to be used as the starting material of the invention and by providing an indigestible dextrin by hydrolyzing the pyrodextrin with alpha-amylase and glucoamylase and separating off a digestible fraction from the resulting hydrolyzate by ion exchange resin chromato-graphy. The values of analytical data as to samples (especially those of dextrin for use in the present invention) herein given are those calculated as solids. The number average molecular weight will be abbreviated as MN, the weight average molecular weight as MW, and the ratio of weight average molecular weight to number average molecular weight as MW/MN. Glucose residues having a 1→ 4 linkage only will be expressed as "glucose residues having a 1→ 4 linkage," and similar expressions will be used also for 1→ 6 linkage and 1→ 3 linkage. The numerical values used for the compositions of food examples and feed examples are those of moisture-containing components. The dietary fiber contents and caloric values given in these examples, except for those of indigestible dextrin, are calculated according to "Tables of Standard Compositions of Japanese Foods," Fourth Edition (edited by Science & Technology Agency, Resources Council, 1982). The starch to be used for preparing the indigestible dextrin of the invention is potato starch, to which an acid needs to be used as a catalyst. Although various acids are usable, hydrochloric acid is especially preferable to use since the product is used for foods. To meet the requirement for use in foods, the product preferable has higher contents of indigestible component and dietary fiber. Thus, the product should contain at least 37% of an indigestible component and at least about 8% of dietary fiber and should be up to about 3 kcal/g in caloric value 1 and caloric value 2. More preferably, the fraction of the product other than glucose should contain at least 80% of an indigestible component and at least 18% of dietary fiber and should be up to 2 kcal/g in caloric value 1 and up to about 1.5 kcal/g in caloric value 2. Incidentally, pyrodextrins include white dextrin which has heretofore been used generally for foods and pharmaceuticals. White dextrin contains up to 30% of indigestible component and up to 3% of dietary fiber, is about 3.9 kcal/g in both caloric values 1 and 2, and is therefore unusable for foods. Further when containing at least 30% of indigestible component and at least 12% of dietary fiber and having caloric values 1 and 2 of up to 3 kcal/g, such dextrin tastes stimulating and can not be used therefore. The pyrodextrin for use in the present invention is prepared by adding an aqueous solution of hydrochloric acid, about 1% in concentration, to starch in an amount of 3 to 10% based on the starch, and heating the starch. Since the aqueous acid solution is added before the heat treatment, the starch and the acid are uniformly mixed together by being agitated and aged in a mixer, and the mixture is then heated at 150 to 200°C for 10 to 120 minutes, preferably for 15 to 60 minutes, unlike the heating condition for preparing conventional pyrodextrins (white dextrin and yellow dextrin). If the reaction temperature is higher, the resulting product will contain increased amount of indigestible component and dietary fiber and have a lower caloric value, whereas increased amount of colored substance will be formed as the temperature rises from about 180°C, so that the temperature is preferably 150 to 180°C. Since the reaction can be conducted at a high temperature within a shortened period of time by suitably selecting the heater to be used, the mixture can be heat-treated efficiently using an apparatus capable of effecting a uniform reaction. Further because the starch is reacted in the form of powder, there arises a need to alter the heating condition for mass production, so that it is desirable to suitably vary the heating condition by checking the quality of the product as treated. Next, the pyrodextrin is dissolved in water to a concentration of 20 to 45% and then hydrolyzed with alpha-amylase and thereafter with glucoamylase. Useful alpha-amylases are those commercially available, among which TERMAMYL (heat-resistant alpha-amylase produced by Bacillus licheniformis and manufactured by NOVO Industry Co., Ltd.) is most desirable. Since the pyrodextrin solution has been made acidic with the acid added before the heat treatment, the solution must be adjusted to an optimum pH value for the amylase to be used, with any of common alkalis. Sodium hydroxide is commercially available in the form of a solution and is therefore most advantageous to use. The preferred pH is 5.5 to 6.5. If the value is lower than this range, a reduced reaction velocity will result, whereas higher pH values entail pronounced coloration. After the adjustment of pH, alpha-amylase is added to the solution usually in an amount of about 0.05 to about 0.2%. The reaction temperature need not to be as high as that is used for the preparation of maltodextrin. Since high temperature rather results in promoted coloration, the temperature is preferably 80 to 90°C. Satisfactory results can be achieved by conducting the reaction usually for about 1 hour. The reaction mixture is subsequently hydrolyzed with glucoamylase. Any of commercial glucoamylase is useful for this purpose. Glucoamylase generally contains a small amount of alpha-amylase, so that glucoamylase, if singly used, exhibits the effect to be produced by the conjoint use of alpha-amylase and glucoamylase. However, when the amount of alpha-amylase contained is lesser, the effect achieved is slightly smaller than is contemplated by the invention. The most preferred result can be achieved by using alpha-amylase and glucoamylase in combination. The pH preferable for the activity of glucoamylase is 4.0 to 6.0. Like alpha-amylase, glucoamylase is used in an amount of about 0.05 to about 0.2%. The reaction is conducted at a temperature of about 55 to about 60°C usually for 24 to 48 hours. The amount of each of the amylases to be used is not limited to the foregoing range but may be used in an amount equivalent thereto in accordance with the activity of the amylase. The reaction time is controllable as desired by varying the amount. The hydrolyzate obtained by hydrolyzing pyrodextrin with alpha-amylase may be autoclaved at 115 to 135°C, then reacted with alpha-amylase again and thereafter with glucoamylase, whereby the hydrolyzate can be filtered at a higher rate for refining. The hydrolyzate resulting from the reaction with glucoamylase is lowered in pH to about 3.5, then heated to about 80°C, and thereafter decolorized with activated carbon, filtered, and desalted and decolorized with ion exchange resin in usual manner. The hydrolyzate is subsequently concentrated to a concentration of about 50% and thereafter subjected to continuous ion exchange resin chromatography to separate off the glucose formed. For this procedure, commercial strongly acidic cation exchange resins are usable. Examples of such resins which are desirable are AMBERLITE IR-116,IR-118, IR120-B, XT-1022E and XT-471F (brand names for products of Japan Organo Co., Ltd.), DIAION 2K-1B, SKK-102, SK-104, SK-106,SK-110, SK-112, SK-116 and FR-01 (brand names for products of Mitsubishi Chemical Industries, Ltd.), and XFS-43281.00, -43280.00, -43279.00 and -43278.00 (brand names for products of Dow Chemical Japan). It is desirable to use these resins usually as combined with an alkali metal or alkaline earth metal. To render the indigestible fraction efficiently separable from the glucose fraction, it is desirable to pass the hydrolyzate at a flow rate as adjusted to the resin used. The flow rate, SV, is 0.1 to 0.6, preferably 0.2 to 0.4. If the flow rate is outside this range, the operation efficiency or separation efficiency tends to become lower. The hydrolyzate is passed through the column at a temperature of 20 to 70°C, preferably 50 to 70°C. At lower temperature, inefficient separation will result, and an increase in the viscosity of the liquid is likely to cause trouble to the resin, whereas at higher temperature exceeding the specified range, the liquid is likely to turn brown or become otherwise degraded. While the separation procedure decreases the glucose content to about 0.5%, the glucose content is adjustable as desired by altering the separation condition. Accordingly, in the case where it is desired to use the glucose as a sweetener, the product can be obtained with an increased glucose content. For example when the hydrolyzate as treated with glucoamylase has a glucose content of 50%, a product with an overall glucose content of about 33% can be obtained by separating off one-half, i.e., 25%, of the glucose from the hydrolyzate. Further it is possible to separate off, along with glucose, a fraction including oligosaccharides and having a medium molecular weight by the separation procedure to obtain a fraction having an increased dietary fiber content of up to about 85%. Experimental data will be described below to further clarify the features of the present invention. The content was measured by a modified method according to "The method for determining the indigestible part using HPLC" (Journal of Japanese Society of Starch Science, Vol. 37, No. 2, p. 107, 1990) as will be described below. A sample was methylated by a modified method of Hakomori's methylation method (S. Hakomori, J. Biochem., 55, 205(1964)) described below, followed by hydrolysis and thereafter by gas chromatography to quantitatively determine the glycosidic linkages composing the sample. A dehydrated sample (100 to 200µg) is placed into a test tube (15mm diam. x 100mm) with a screw cap and dissolved by addition of 0.3mℓ of DMSO. To the solution is added 20mg of NaH, immediately followed by addition of 0.1mℓ of methyl iodide. The mixture is stirred by a touch mixer for 6 minutes and then cooled in ice water, and 2mℓ of water is added to the mixture. The mixture is fully shaken with addition of 2mℓ of chloroform. The upper layer (aqueous layer) is collected with a pipette and discarded. The remaining layer is similarly washed with addition of 2mℓ of water. This procedure is repeated 6 times. Cotton is placed on the bottom of a Pasteur pipette, anhydrous sodium sulfate is placed into the pipette to form a 4- to 5-cm-thick layer, and the solution is passed through the layer for dehydration and then washed with chloroform. Subsequently, the solution is concentrated to dryness in a rotary evaporator. With addition of 0.5mℓ of trifluoroacetic acid, the methylated product is hydrolyzed at 100°C for 4 hours, and the hydrolyzate is concentrated to dryness at 60°C in a rotary evaporator. The hydrolyzate is dissolved in 0.5mℓ of water, and the solution is allowed to stand at room temperature for 2 hours with addition of 10mg of sodium borohydride. Several drops of acetic acid are added to the mixture until the mixture ceases forming to terminate the reaction. The mixture is then dried at room temperature and further dried at room temperature with addition of 1mℓ of methanol to remove the boric acid formed. This procedure is repeated 6 times. With addition of 0.5mℓ of acetic anhydride, the reduced product is heated at 100°C for 4 hours and thereby acetylated. With addition of 1mℓ of toluene, the product is concentrated to dryness in a rotary evaporator. The acetylated product is dissolved in 1mℓ of chloroform, the solution is shaken with addition of 1mℓ of water, and the aqueous layer is discarded. After repeating this procedure 5 times, the chloroform is evaporated off from the resulting layer by a rotary evaporator. The desalted product is dissolved in 0.5mℓ of chloroform and subjected to gas chromatography. The same solution as used for the quantitative determination of glucose is passed through a column of ion exchange resin of the mixed bed type at SV of 1.0 for desalting, and the effluent is concentrated to a concentration of 5% using a rotary evaporator to obtain a sample. A 20-µl protion of the sample is subjected to liquid chromatography under the following conditions. One gram of sample is accurately weighed out, placed into a 100-mℓ measuring flask and diluted to 100mℓ with distilled water. This solution is used for the quantitative determination of glucose by the pyranose oxidase (Determiner GL-E, product of Kyowa Medic Co., Ltd.) method. Dietary fibers are quantitatively determined by the following Prosky method (No. 985.29, Total Dietary Fiber in Foods, "Official Methods of Analysis", AOAC, 15th Ed., 1990, P.1105∼ 1106, No.985.29, Total Dietary Fiber in Foods). According to the following method titled "Measurement of Physiological Combustion Heat of Food for Specified Health Use Containing Water-Soluble Low Calorie Sugars" which is notified by the Ministry of Health and Welfare of Japan. 90g of Potassium sodium tartrate and 225g of sodium tertiary phosphate (Na₃ PO₄ · 12H₂O) is dissolved in 700mℓ of distilled water, and 30g of copper sulfate (CuSo₄ · 5H₂O) and 3.5g of potassium iodate (KIO₃) are added to the solution. The resulting solution is diluted to 1000mℓ with distilled water. F-kit D-sorbitol/xylitol, product of Boehringer Mannheim Yamanouchi Pharmaceutical Co., Ltd.
2% solution of diastase (Japanese Pharmacopoeia). Solution of 100mg of hydroxylamine in 10mℓ of pyridine. Oligosaccharides are thoroughly extracted from the sample using water or 89% ethanol when the sample contains only oligosaccharides or using 80% ethanol when the sample contains starch and like polysaccharides. The extract is concentrated under reduced pressure (at not higher than 60°C), the residue completely dissolved in a small amount of 50mM maleic acid-Na buffer (pH 6.0), and the solution adjusted to a glucose concentration of about 500mg %. To 1 part of the test solution is added 2 parts 1N hydrochloric acid, and the mixture heated in a boiling water bath at 100°C for 20 hours. The reducing sugar of the resulting solution is determined by the Somogyi method, and pentose and hexose alcohols therein by gas chromatography or F-kit. The combined amount of carbohyrates determined is taken as the amount of total water-soluble saccharides (A). 2.5mℓ of somogyi solution is added to 7.5mℓ of test solution (1 to 10mg, calculated as reducing sugar), and the mixture is heated at 100°C for 10 minutes, cooled and then thoroughly mixed with 2mℓ of 2.5% of potassium iodide (KI) solution and 3mℓ of 2N sulfuric acid. The mixture is titrated with 1/40N sodium thiosulfate (Na₂SO₃ · 5H₂O). Glucose is used as a standard saccharide. The sugar content of the test solution is determined from the titration value obtained. The test solution hydrolyzed for the determination of total water-soluble sugar is suitable diluted and used to measure the amounts of sorbitol and xylitol by F-kit. In case the solution contains pentose or hexose alcohol other than sorbitol and xylitol, gas chromatography is used. The test solution hydrolyzed for the determination of total water-soluble sugar is concentrated under reduced pressure at a temperature of up to 60°C; ethanol is added to the concentrate so as to give a final concentration of at least 80%, and the mixture is heated in a boiling water bath for 30 minutes for extraction. The extract obtained is concentrated under reduced pressure at no higher than 60°C. To the concentrate is added 80% ethanol to obtain a predetermined amount of solution. A 5mℓ portion of this solution is collected, from which the solvent is completely removed under reduced pressure. The residue is dissolved in 1mℓ of pyridine; 1mℓ of hydroxylamine pyridine solution is added to the solution, and the mixture is allowed to stand for 5 minutes and thereafter distilled under reduced pressure to remove the solvent. With the addition of 1mℓ of benzene, the residue is treated under reduced pressure to completely remove water, and the resulting residue is dissolved with 2mℓ of pyridine. To the solution are added 0.2mℓ of hexamethyldisilane and 0.1mℓ of trimethylsilane, and the mixture is allowed to stand at room temperature for at least 15 minutes, thereafter adjusted to a predetermined amount with pyridine and subjected to gas chromatography to quantitatively determine sugar alcohol by the absolute calibration curve method. As to samples containing starch, the sample used corresponds to 2.5 to 3.0mg dry weight resulting residue from extraction with 80% ethanol in the same manner as the extraction of total water-soluble sugar. The residue is dispersed in 200mℓ of water, and the dispersion is heated in a boiling water bath for 15 minutes while being continuously stirred, followed by cooling to 55°C and addition of 10mℓ of diastase solution. The resulting mixture is allowed to stand at 55°C for 1 hour, then boiled for several minutes and thereafter cooled to 55°C again, followed by addition of 10mℓ of diastase solution, continuous stirring and standing for 1 hour. When the substance remaining in the resulting reaction mixture is found positive by iodine-starch reaction, diastase solution is added to the mixture once again for further digestion. If the solution as treated with diastase proves negative when checked by iodine-starch reaction, the solution is diluted to 250mℓ with distilled water, then filtered with filter paper. Hydrochloric acid is added to the filtrate to a concentration of 2.5%, and the mixture is heated in a boiling water bath for 2.5 hours, cooled, thereafter neutralized with 10% sodium hydroxide solution and filtered. The filtrate is suitably diluted and used for the determination of glucose by the Somogyi method. The amount of glucose thus determined is multiplied by 0.9 to obtain a value which is the amount of starch (A′). Rat small intestine acetone powder, product of Sigma, is put into suspension with addition of physiological saline (0.9% NaCl). The suspension is urtrasonic treated (60 seconds, three times) and thereafter centrifuged (3000 r.p.m., 30 minutes) to obtain a supernatant serving as an enzyme solution. The protein content of the enzyme solution is determined by the Lowry method The enzyme activity is adjusted to at least about 0.1 mg/mg protein/hour in terms of sucrose hydrolysis ability. The sample to be used is the same extract as is obtained with use of 80% ethanol or water for the determination of total water-soluble sugar. The extract is concentrated and then diluted with 50mM maleic acid-Na buffer (pH 6.0) to a sugar concentration of 1 to 4%. A 1.0mℓ portion of the solution is admixed with 1.0mℓ of the enzyme solution and is reacted therewith at 37°C for 1 hour. The reaction mixture is heated in a boiling water bath for 10 minutes for inactivation and centrifuged (3000 r.p.m., 30 minutes) to obtain a supernatant. The reducing sugar content of the supernatant is determined by the Somogyi method, and the sugar alcohol content thereof by F-kit or gas chromatography. The sum of these contents is taken as the amount of enzyme-digested absorbable sugar. The contents determined are to include the reducing sugar and sugar alcohol which are originally present in the sample. The decomposition rate is the amount of digested absorbable sugar divided by the amount of total water-soluble sugar and multiplied by 100. As a control test, the same procedure as above is repeated for sucrose or maltose in the same amount as the total water-soluble sugar amount. When sucrose is used for the control test, the decomposition rate is to be at least 20%. The ratio of the decomposition rate obtained for sucrose or maltose to the decomposition rate obtained for the sugar determined is taken as the small intestine digestion absorption ratio; this ratio multiplied by the total water-soluble reducing sugar amount as the amount of total digested absorbable reducing sugar (B), and the amount of total digested absorbable sugar alcohol (C). Which of sucrose and maltose is to be used as the control sugar is determined by the following method. Maltose in one-half the amount of the sugar determined is used as a substrate for a digestion test under the same condition as used for the digestion test with the rat small intestine acetone powder. If the amount of glucose then produced on digestion is up to 10 times the sum of the sugar and sugar alcohol resulting from the digestion test for the sugar determined, maltose is used as the control sugar. If the amount of glucose is larger than 10 times, sucrose is used. A 0.3mℓ of 1N sodium hydroxide is added to 0.1mℓ of sample (containing 20 to 100µg of protein), and the mixture is allowed to stand for at least 15 minutes. 3mℓ of solution A is then added to the mixture, followed by standing at room temperature for 10 minutes. Subsequently, 0.3mℓ of solution B is added to the mixture, and 30 minutes thereafter, the mixture is checked for light absorbancy at 750nm. Bovine serum albumin is used as a standard protein. (1) Fermentable ratio of indigestible dextrin in the large intestine. The effective caloric value of a sample is calculated as the sum of the caloric value resulting from digestion and absorption by the digestive system up to the upper digestive tract, and the caloric value resulting from intestinal fermentation after arrival of the sample at the large intestine. The sample is dissolved in 45mM (bis)Tris buffer (pH 6.0) containing 0.9mM calcium chloride to obtain a 4.55% solution, to which 160 U/g of human saliva alpha-amylase (SIGMA Type IX-A) is added, followed by a reaction at 37°C for 30 minutes. After deactivating the enzyme, the reaction mixture is desalted with an ion exchange resin and adjusted to a concentration of 1.1%. The aqueous solution (4mℓ) is then added to 2mℓ of 50mM hydrochloric acidpotassium chloride buffer (pH 2.0), and the mixture is maintained at 37°C for 100 minutes, followed by desalting with an ion exchange resin. To the desalted solution is added 45mM (bis)Tris buffer (pH 6.0) containing 0.9mM calcium chloride to adjust the solution to a concentration of 0.45%. To the solution is added 400U/g of swine pancreatic amylase (product of Boehringer Mannheim Yamanouchi Co., Ltd.), followed by a reaction at 37°C for 6 hours. The enzyme is then deactivated, and the reaction mixture is thereafter desalted with an ion exchange resin, concentrated and lyophilized. After grouping, the rats were placed into individual steel cages and fed according to the experimental schedule listed in Table 2. The basal diet was given to all the rats in an amount of 5.4g/rat/kg (22.7 kcal/rat/day). For the test groups, glucose or the above sample was added in an amount of 0.5, 1.0, 2.0 or 4.0g to the basal diet. The amount of glucose or sample added was about 2, 4, 8 or 16 kcal/rat/day in terms of caloric value. The amount of ingestion was measured daily, and the gain in the body weight was measured on the Oth, 5th, 10th and 15th days. The rats were checked generally every day by observation. To 15kg of commercial potato starch was sprayed 1125ml of 1% hydrochloric acid solution, and the starch was treated in a mixer to prepare a uniform mixture. The mixture was placed into an aluminum vat, predried in a dryer at 120°C for 1 hour and then heat-treated at 165°C for 180 minutes. During the heat treatment, 2kg portions of the mixture were collected 15 minutes, 30 minutes, 60 minutes, 120 minutes and 180 minutes after the start of the treatment to obtain six samples. The samples were analyzed to determine the contents of glucose, various glycosidic linkages, indigestible component and dietary fiber, caloric value 1, caloric value 2, MN and MW. Detected by this procedure were a glucose residue at each nonreducing end, glucose residues having a 1→ 4 linkage, glucose residues having a 1→ 6 linkage, glucose residues having a 1→ 3 linkage, glucose residues each having both 1→ 4 linkage and 1→ 6 linkage, glucose residues each having both 1→ 3 linkage and 1→ 4 linkage, glucose residue each having both 1→ 2 linkage and 1→ 4 linkage, and glucose residues having other linkages. The value of glucose determined by the method used included the content of glucose residues at the nonreducing ends, so that the content of glucose residues given is this value minus the content of glucose. Table 4 shows the values obtained. The method of quantitative determination is complex and involves errors which are usually about ±5% and are invariably ±2% if minimum. With the sample heated for 180 minutes, the prolonged heating presumable broke down the component sugars of starch, so that the results given in Table 4 will be discussed except for this sample. The contents of indigestible component and dietary fiber increase in proportion to the heating time. The caloric values decrease in inverse proportion to the heating time. The contents of glucose residues with various glycosidic linkages, i.e., those having 1→ 6 glycosidic linkage, those having 1→ 3 glycosidic linkage, those having both 1→ 4 and 1→ 6 glycosidic linkages, those having both 1→ 2 and 1→ 4 glycosidic linkages, and those having other linkages, increase in proportion to the heating time. Only the content of residues with 1→ 4 linkage decreases in inverse proportion to the heating time. The values MN decrease and increase during heating and MW/MN decrease during heating for 30 minutes and increase again in proportion to the heating time after 60 minutes. These variations in the glycosidic linkage contents and average molecular weights with the heating time are novel findings obtained by the experiment for the first time. 2 liters of water was added to 1kg of each of the six samples of Experimental Example 1 to prepare a solution, which was then adjusted to a pH of 6.0 with 20% sodium hydroxide and hydrolyzed with 0.2 wt. % of alpha-amylase (TERMAMYL 60L, product of NOVO Industry Co., Ltd.) at 85°C for 1 hour. The hydrolyzate was cooled to a temperature of 55°C, then adjusted to a pH of 5.5 and hydrolyzed with 0.2 wt.% of glucoamylase (product of Daiwa Kasei Co., Ltd.) for 36 hours, whereupon the resulting hydrolyzate was adjusted to a pH of 3.5 to inactivate the glucoamylase. The hydrolyzate was refined by decolorization with activated carbon, filtration and desalting with an ion exchange resin. The samples thus obtained were analyzed in the same manner as in Experimental Example 1. Table 5 shows the values obtained. The hydrolyzate obtained before the addition of glucoamylase was also checked for MN, MW and MW/MN. Table 6 shows the results. Table 5 reveals the following distinct features. 1) The 1→ 4 glycosidic linkage fraction greatly diminished, but about 10 to about 20% thereof still remained unhydrolyzed. This means that the 1→ 4 linkage fraction which should have been hydrolyzed almost completely with glucoamylase remained unhydrolyzed in an amount as large as 10 to 20%. 2) No marked hydrolysis occurred in the fractions except in the 1→ 4 and 1→ 6 glycosidic linkage fractions. The fact that the caloric values remained almost unincreased indicates that the low-calorie fraction remained almost unhydrolyzed with alpha-amylase and glucoamylase. 3) 1→ 3 glycosidic linkage increased, however reason is unknown. 4) Suppose one-half of glucose is removed, for example, from the sample prepared by 15 minute heating. This results in an indigestible content of 37.3% and a dietary fiber content of 7.8%. 5) The ratio MW/MN, which is about 10 to about 300, is exceedingly greater than the corresponding value of the prior art which is up to 20. Table 6 reveals that the hydrolyzates before being hydrolyzed with glucoamylase were as high as about 40 to about 180 in MW/MN. These result are novel findings obtained by the experiment for the first time. Each of the six samples of Experimental Example 2 was concentrated to obtain about 1.5 liters of 50% solution. 1 liter portion of the solution was passed, at a solution temperature of 60°C and at SV 0.25, through a column packed with 10 liters of XFS-43279 .00 (product of Dow Chemical Japan), strongly acidic cation exchange resin of the alkali metal type. Subsequently, water was passed through the column to collect an indigestible fraction (as separated off from the glucose fraction). The sample thus obtained was analyzed in the same manner as in Experimental Example 1. Table 7 shows the results including average molecular weights, etc. 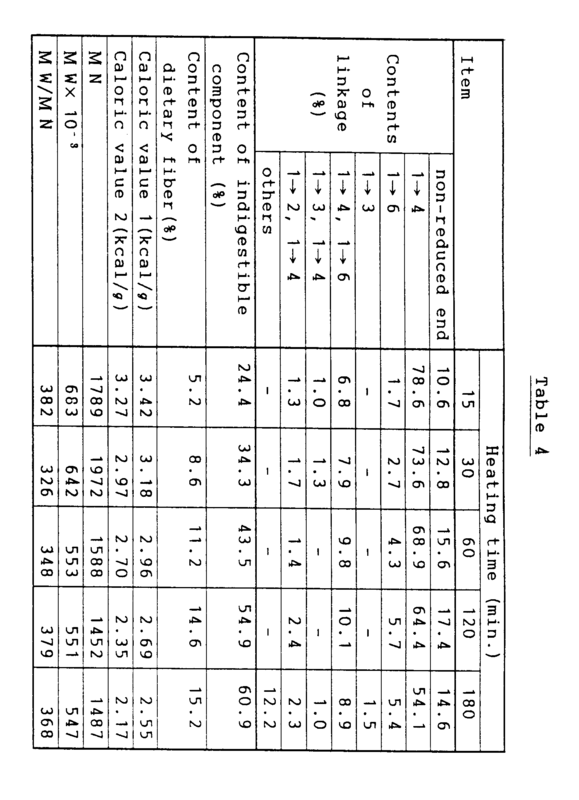 In Table 7, the values were expressed in percentages based on the fraction other than glucose. The content (%) of indigestible component in the fraction other than glucose is a value obtained by subtracting the glucose content (%) from 100, dividing the measured amount of indigestible component by the remainder and multiplying the quotient by 100. Similarly, the content (%) of dietary fiber in the fraction other than glucose is a value obtained by subtracting the glucose content (%) from 100, dividing the measured amount of dietary fiber by the remainder and multiplying the quotient by 100. Further similarly, the caloric value of the fraction other than glucose is a value obtained by multiplying the glucose content (%) by 4 (caloric value of 1g of glucose), dividing the product by 100 and subtracting the quotient from the measured caloric value. The theoretical yield is a value obtained by subtracting the glucose content of Table 5 from 100. With reference to Table 7, the content of indigestible component and the caloric values each remain make no difference with the heating time, but the dietary fiber content increases in proportion to the heating time. The theoretical yield, which corresponds to the proportions of indigestible component, dietary fiber and low calorie component, increases in proportion to MN, MW and MW/MN. The table further reveals that the theoretical yield increases to at least about 40% when MW/MN is at least 25. This indicates that the hydrolyzate before the separation of the glucose fraction by the ion exchange resin is high in the contents of indigestible component and dietary fiber and low in caloric values. Consequently, MN was found to have the highest correlation with X5 (amount of glucose residues having both 1→ 4 and 1→ 6 glycosidic linkages) of all the contents of eight kinds of glycosidic linkages as represented by the equation of Table 8, No. 5 (correlation coefficient: 0.945). This equation (hereinafter referred to as "Equation 1") reveals the novel fact that the smaller the amount of glucose residue having both 1→ 4 and 1→ 6 glycosidic linkages, the greater the MN, that is, the higher the content of indigestible component and dietary fiber the lower the caloric value. To 300kg of commercial potato starch was added 5.8 liters of 3% hydrochloric acid, and the starch was treated in the same manner as in Experimental Example 1 except that the starch was heat-treated at 180°C for 30 minutes, followed by the same procedures as in Experimental Examples 2 and 3 to obtain a sample. The sample was analyzed in the same manner as in Experimental Example 3. The Variation of the calculated value from the measured value was -17.4% in Experimental Example 4 and +8.9% in Experimental Example 5. 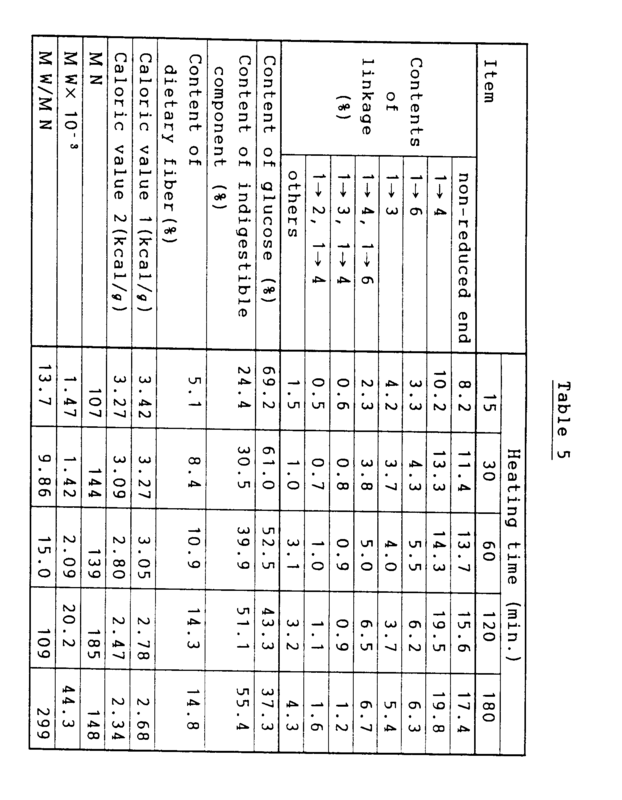 The dietary fiber content, which was 23.1% in Table 7, increased to a maximum of 85.8% as shown in Table 10. A sample was prepared in the same manner as in Experimental Example 4 with the exception of adding 22.5 liters of 1% hydrochloric acid to 300kg of commercial corn starch, treating the mixture in the same manner as in Experimental Example 1 and heating the mixture at 165°C for 1 hour. The sample was analyzed in the same manner as in Experimental Example 4. MN was calculated from Equation 1. A sample was prepared in the same manner as in Experimental Example 4 with the exception of adding 22.5 liters of 1% hydrochloric acid to 300kg of commercial sweet potato starch, treating the mixture in the same manner as in Experimental Example 1 and heating the mixture at 165°C for 1 hour. The sample was analyzed in the same manner as in Experimental Example 4, and MN was calculated from Equation 1. With reference to Table 11, the difference of the calculated MN value from the measured value is -36.5% in Comparative Example 1 and -36.2% in Comparative Example 2, hence a great difference. This indicates that the correlation between the content of glucose residue having both 1→ 4 and 1→ 6 glycosidic linkages and MN as represented by Equation is absent therebetween, showing that different starches serving as materials produce products which are greatly different in structure even if heat-treated under the same condition. Table 12 shows that the whiteness decreases in inverse proportion to the heating time and heating temperature. Next to check the indigestible dextrin of the invention for physiological activities, the samples of Examples 2 to 4 to be described later were used, which will be referred to as "samples A, B and C" respectively, in Experimental Examples 8 to 14. Male rats of Sprague-Dawley strain (6 rats/group) initially weighing about 50g were accommodated in individual cages placed in a small animal breeding chamber controlled to 23±2°C, preliminarily raised with a commercial synthetic diet for 1 week, and thereafter fed for 7 days with a basal diet, or the basal diet containing 5% of the sample A, B or C added thereto, or the basal diet containing 5% cellulose (Avicel, product of Sanyo-Kokusaku Pulp Co., Ltd.) with free access to water and the diet. The intake of diet and changes in body weight were recorded daily. On the seventh day, carmine (pigment) was given as admixed with the diet, and the time taken for the carmine to appear in feces was measured as transit time. The animals were thereafter sacrificed with blood taken, and the cecum was removed and checked for the weight thereof, pH of the contents of the cecum and the amount of butyric acid therein. Table 13 shows the average values of results obtained. The results listed in Table 13 reveal that the sample A, B or C reached the large intestine while remaining indigested, metabolized to organic acids under the action of enterobacteria and resulted in a lower pH within the intestine. While the ingestion of any of the samples A, B and C shortened the transit time, comparison with the group receiving cellulose, which is effective for improved defecation, indicated that the samples A,B and C were effective. Accordingly, the sample B was further used for clinical tests to substantiate its effect. Each value listed is mean value, and the mark * indicates a significance level of 5% relative to the non-ingestion period, hence a significant difference. The sample B was checked for a constipation alleviating effect. The sample was given to 25 volunteers having a tendency toward constipation at a predetermined dose for at least 5 days. Changes resulting from the administration of the sample in defecation were checked with a questionnaire. Scores were assigned to the check items on the questionnaire according to the following criteria to substantiate the effect through a statistical procedure. With reference to Table 15, the sample B, when administered at a dose of at least 5g, resulted in increased scores and was found effective for alleviating constipation. Rats were used for a nutritional experiment to check the samples A, B and C for a serum lipid lowering effect. The results achieved by the test groups are expressed in mean values. The diet efficiency was calculated from Equation 2. As seen from Table 17, there was no difference between the three sample groups in weight gain and diet efficiency. However, the sample A, B and C groups were apparently lower in serum total cholesterol value and neutral fat value than the control group. The samples A and B were found to be remarkably effective. Accordingly, sample B was further tested clinically. 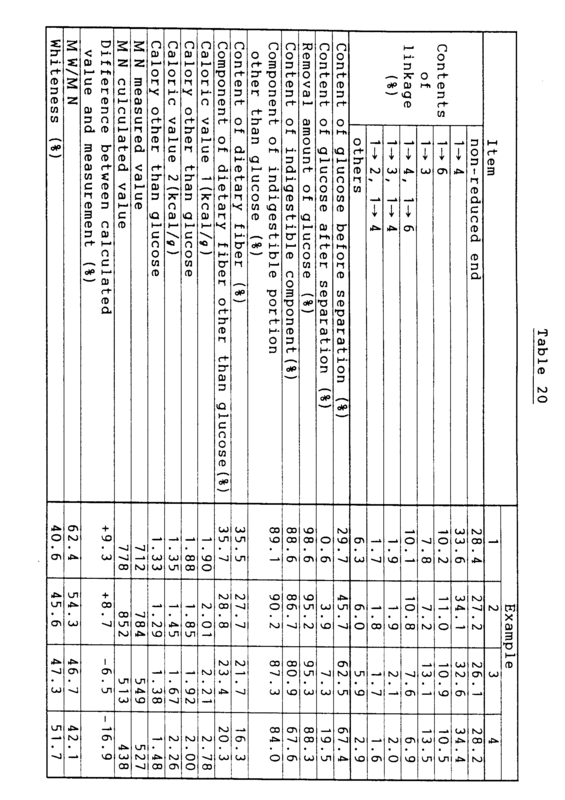 Table 18 reveals that the administration of the sample B altered the serum total cholesterol value toward the normal value (120∼ 250 mg/dl). Those who were higher than the normal in this value exhibited a reduction. As similar result was observed also with respect to the neutral fat value. These results substantiate that the sample B has a remarkable effect in improving serum lipid metabolism. An experiment conducted with 36 rats revealed that the blood sugar value of 98.3 mg/dl on average and the insulin secretion of 18.5 µU/mℓ on average, when the rats were hungry, increased to the highest levels of 159 mg/dl and 82.4 µU/mℓ on average, respectively, 30 minutes after glucose was orally given to the rats in an amount of 1.5 g/kg body weight, and lowered to the respective normal values 120 minutes thereafter. However, addition of the sample B and C to the glucose in an amount of 0.15g (in a proportion of 1/10 to the amount of glucose) resulted in smaller increases 30 minutes after administration; the average blood sugar value thereby increased and were 163 mg/dl and 164 mg/dl, respectively, and the average value of insulin secretion thereby increased and were 40.2 µU/mℓ and 44.5 µU/mℓ, respectively. This indicates that the sample B and C significantly suppresses the rise of blood sugar value and insulin secretion due to glucose. Table 19 reveals the sample B and C has an activity to prevent the increasing of insulin secretion. To sum up the foregoing results of experimental data analysis, the product of the invention obtained by hydrolyzing pyrodextrin with alpha-amylase and glucoamylase distinctly differs from known pyrodextrins with respect to the following. More specifically stated, the fraction of the present dextrin other than glucose has the following features. (1) The content of indigestible component is max 94.5%, and the dietary fiber content is max 26.5%. With the fraction of oligosaccharides further removed, the fraction maximally contains 85.8% of dietary fiber and is minimally 1.75 kcal/g in caloric value 1 and 1.17 kcal/g in caloric value 2. (2) In MN, the fraction is about 500 to about 1000 as compared with conventional pyrodextrins which are at least 1450. The theoretical yield is at least about 39% in the case where MW/MN is at least 25. The contents of indigestible component and dietary fiber increase in proportion to the value-MW/MN, and the caloric value decreases in inverse proportion thereto. (3) In the content of glucose residues having 1→ 4 glycosidic linkage, the fraction is about 25 to about 30% against about 54% of known pyrodextrins. (4) In the content of glucose residues having 1→ 6 glycosidic linkage, the fraction is about 10 to about 11% against about up to 6% of known pyrodextrins. (5) In the content of glucose residues having 1→ 3 glycosidic linkage, the fraction is about 7 to about 14% against about up to 2% of known pyrodextrins. (6) As represented by Equation 1, the content of glucose residues having both 1→ 4 and 1→ 6 glycosidic linkages has close correlation with the MN of the fraction. This means that there is close correlation between the content of glucose residues having both 1→ 4 and 1→ 6 glycosidic linkages and the proportions of indigestible component and dietary fiber formed. (7) When at least one-half of digestible glucose is removed from the hydrolyzate to obtain an indigestible fraction, the fraction contains at least 37.3% of indigestible component, 7.8% of dietary fiber and is up to 3.11 kcal/g in caloric value 1 and up to 2.88 kcal/g in caloric value 2. (8) A starch other than potato starch, i.e., corn starch or sweet potato starch, was treated under the same condition as potato starch. The content of glucose residue having both 1→ 4 and 1→ 6 glycosidic linkages and present in the product obtained was substituted in Equation 1 to calculate MN. A great difference of at least about -36% was found between the calculated value and the actual measurement. This indicates that Equation 1 is true only with potato starch specifically. (9) An increase in the content of indigestible component results in an increased dietary fiber content and a reduced caloric value. (10) Furthermore, the indigestible dextrin, when ingested, is found effective for improving the internal environment of the intestine and eliminating constipation and diarrhea as by giving a lower pH to the interior of the intestine and increasing the amounts of short chain fatty acids having an intestine conditioning effect. (11) The dextrin further acts to diminish cholesterol and neutral fats among other serum lipids, consequently preventing arterial sclerosis and hypertension. (12) Furthermore the dextrin has activity to reduce the insulin secretion. (13) Because of these effects, the indigestible dextrin of the present invention is very useful as a material for alimentotherapy to accomplish the above purposes. The above experimental results show that the product of the invention is a novel substance containing exceedingly larger amounts of indigestible component and dietary fiber and having a lower caloric value than conventional pyrodextrins, and greatly different from known pyrodextrins in structure. The Experimental data further indicates that the whiteness decreases in inverse proportion to the heating time. The decrease in whiteness demonstrates an increase in the amount of colored substance due to the heat treatment. The increase in the amount of colored substance presents difficulty in refining the product before the separation, consequently lowering the efficiency of the ion exchange resin for use in the separation treatment. The whiteness must therefore be at least 30%, preferably at least 40%. Table 12 shows that the heat treatment is to be conducted preferably for not more than 60 minutes when the heating temperature is 150°C, or for not longer than about 45 minutes at 165°C or for not longer than 30 minutes at 180°C. Although the progress of the reaction can be controlled by varying the amount of acid to be added to potato starch, use of a greatly increased amount of acid causes corrosion or abrasion to the apparatus, so that the optimum amount of acid to be used is up to 3000ppm, preferably about 1000ppm, based on the starch. Examples of the present invention will be given below. Commercial potato starch (2500kg) was placed into a ribbon mixer, and 188 liters of 1% hydrochloric acid solution was sprayed onto the starch with use of pressurized air while rotating the mixer. The mixture was then passed through a disintegrator to obtain a uniform mixture, which was thereafter aged in the ribbon mixer for 8 hours. The mixture was predried to a moisture content of about 4% by a flash dryer, subsequently continuously charged into a converter of the rotary kiln type and heat-treated at 165°C for 40 minutes to obtain a pyrodextrin. Water (4000 liters) was added to the pyrodextrin (2000kg) to prepare a solution, which was then adjusted to a pH of 6.0 with 20% aqueous solution of sodium hydroxide. With addition of 0.1 wt. % of alpha-amylase (TERMAMYL 60L, product of NOVO Industry Co., Ltd.), the solution was hydrolyzed at 90°C for 1 hour. The hydrolyzate was then autoclaved at 125°C for 10 minutes, thereafter discharged into the atmosphere, cooled to a temperature of 57°C, adjusted to a pH of 5.5 and hydrolyzed for 40 hours with 0.1 wt. % of glucoamylase (product of Daiwa Kasei Co., Ltd.) added thereto. The resulting hydrolyzate was adjusted to a pH of 3.6 to inactivate the glucoamylaze. The hydrolyzate was decolorized with activated carbon, filtered, desalted with ion exchange resins and thereafter concentrated to obtain a 50% solution. A 20 liter portion of the solution was passed at 60°C at SV 0.25 through the column of a continuous chromatographic device packed with 10 liters of XFS-43279.00 (product of Dow Chemical Japan), which is a strongly acidic cation exchange resin of the sodium type. Subsequently, water was passed through the column to separate off a glucose fraction and obtain an indigestible fraction. The fraction was concentrated to concentration of 50% and spray dried to obtain about 4kg of an indigestible dextrin having a moisture content of 4.1%. Commercial potato starch (2500kg) was placed into a ribbon mixer, and 125 liters of 2% hydrochloric acid solution was sprayed onto the starch with use of pressurized air while rotating the mixer. The mixture was then passed through a disintegrator to obtain a uniform mixture, which was thereafter aged in the ribbon mixer for 10 hours. The mixture was predried to a moisture content of about 3% by a flash drier, subsequently continuously charged into a converter of the rotary kiln type and heat-treated at 150°C for 55 minutes to obtain a pyrodextrin. Commercial potato starch (2500kg) was placed into a ribbon mixer, and 100 liters of 3% hydrochloric acid solution was sprayed onto the starch with use of pressurized air while rotating the mixer. The mixture was then passed through a disintegrator to obtain a uniform mixture, which was thereafter aged in the ribbon mixer for 10 hours. The mixture was predried to a moisture content of about 3% by a flash drier, subsequently continuously charged into a converter of the rotary kiln type and heat-treated at 180°C for 25 minutes to obtain a pydrodextin. Water (5000 liters) was added to the pydrodextrin (2000kg) to prepare a solution, which was then adjusted to a pH of 5.8 with 20% aqueous solution of sodium hydroxide. With addition of 0.15 wt. % of alpha-amylase (TERMAMYL 60L, product of NOVO Industry Co., Ltd.), the solution was hydrolyzed at 86°C for 1 hour. The hydrolyzate was then cooled to a temperature of 55°C, adjusted to a pH of 5.6 and hydrolyzed for 36 hours with 0.1 wt. % of glucoamylaze (product of Daiwa Kasei Co., Ltd.) added thereto. The resulting hydrolyzate was adjusted to a pH of 3.5 to inactivate the glucoamylase. The hydrolyzate was thereafter treated in the same manner as in Example 2, giving about 4kg of an indigestible dextrin having a moisture content of 4.5%. Commercial potato starch (2500kg) was placed into a ribbon mixer, and 376 liters of 0.5% hydrochloric acid solution was sprayed onto the starch with use of pressurized air while rotating the mixer. The mixture was then passed through a disintegrator to obtain a uniform mixture, which was thereafter aged in the ribbon mixer for 8 hours. The mixture was predried to a moisture content of about 4% by a flash drier, subsequently continuously charged into a converter of the rotary kiln type and heat-treated at 165°C for 15 minutes to obtain a pyrodextrin. Water (4000 liters) was added to the pyrodextrin (2000 kg) to prepare a solution, which was then adjusted to a pH of 6.0 with 20% aqueous solution of sodium hydroxide. With addition of 0.1 wt. % of alpha-amylase (TERMAMYL 60L, product of NOVO Industry Co., Ltd.), the solution was hydrolyzed at 82°C for 1 hour. The hydrolyzate was then autoclaved at 125°C for 10 minutes, thereafter discharged into the atmosphere, cooled to a temperature of 57°C, adjusted to a pH 5.5 and hydrolyzed for 36 hours with 0.1 wt.% of glucoamylase (product of Daiwa Kasei Co., Ltd.) added thereto. The resulting hydrolyzate was adjusted to a pH of 3.6 to inactivate the glucoamylase. The hydrolyzate was refined and concentrated in the same manner as in Example 1 to obtain a 52% solution. A 20 liter portion of the solution was passed at 60°C at SV 0.3 through the column of a continuous chromatographic device packed with 10 liters of DIAION SKK-116 (product of Mitsubishi Chemical Industries, Ltd.), which is a strongly acidic cation exchange resin of the sodium type. Subsequently, water was passed through the column to separate off 71% of glucose formed and obtain an indigestible fraction. The fraction was concentrated to obtain about 8kg of a liquid indigestible dextrin having a concentration of 70%. The solutions obtained in Examples 1 to 4 before the separation procedure were checked for glucose content, and the indigestible dextrins obtained in these examples were analyzed to determine the glucose content, amount (%) of glucose removed, contents of various glycosidic linkages (determined by "Hakomori's methylation method") and content of indigestible component. The fraction of each of these dextrins other than glucose was also analyzed to determine the indigestible component, MN as actually measured, MN as calculated from Equation 1, variation of the calculated value from the measured value and MW/MN. The results are collectively listed in Table 20, which also shows the whiteness of each pyrodextrin. Although, the appearent glucose separation persentages in these four examples are 98.0%, 91.5% 88.3% and 71.1%, respectively. The indigestible dextrin of the present invention is usable for almost all foods. The term "foods" as used herein refers collectively to foods for man and feeds for livestock and for use in zoos and for pets. The indigestible dextrin is prepared from starch, is soluble in water, contains dietary fiber, and is usable also as a low calorie bulking agent in foods, so that it is usable in any food wherein dextrin and maltodextrin are usually usable. More specifically, the indigestible dextrin is effectively usable for liquid or powdery beverages such as coffee, black tea, cola and juice; baked products such as bread, cookies, crackers, cakes, pizza and pies; noodles such as wheat noodles, Chinese noodles and buckwheat noodles; pasta such as spaghetti, macaroni and fettuccine; confectionery such as candies, chocolate and chewing gum; doughnut, potato chips and like fried cakes or foods; ices such as ice cream, shakes and sherbets; daily products such as cream, cheese, milk powder, condensed milk, creamy powder, coffee whitener and milk beverages; chilled desserts such as custard pudding, yoghurt, drinkable yoghurt, jelly, mousse and Bavarian; retorted pouched or canned foods such as soups, stew, gratin and curries; seasonings such as bean paste, soy sauce, Worceter sauce, ketchup, mayonnaise, dressing, bouillon and roux; processed meat products such as ham, sausage, hamburger, meatball and corned beef, and these products as frozen; frozen processed foods such as pilafs, croquettes, omelets and doria; processed fishery products such as artificial boiled crab paste and boiled fish paste; processed agricultural products such as dried mashed potatoes, jam, marmalade, peanut butter and peanut; others including food boiled down in soy, rice cakes, rice snacks and fast foods; alcoholic beverages such as wines, cocktails, fizzes and liqueur; etc. However, the dextrin is difficult to use in emulsified foods of the W/O type, such as margarin, since the dextrin incorporated therein is liable to separate off during preservation. Further when serving as a low calorie bulking agent, the dextrin can be added to the food of the inventionin in an amount which is not limited insofar as the quality of the food is not impaired However, if adults in good health take the low calorie bulking agent in an amount of 2g/kg body weight by way of foods of the invention, diarrhea will occur in half of them, so that the amount of the agent to be taken is preferably not greater than half of this value, i.e., up to about 1g/kg body weight. Nevertheless, since the influence on physiological activities differs from person to person, it is most desirable to alter the amount in view of the effect achieved by the ingestion of the low calorie foods. To check the indigestible dextrin for characterisitics when it is used in foods, chiefly the product of Example 6 was used in the foolowing experiments to obtain characterisitic dats. The indigestible dextrin is about 10 in sweetness, tasting slightly sweet. A 30% solution of indigestible dextrin was checked for viscosity at temperatures of 10 to 80°C using a Brookfield type viscosimeter. FIG.1 shows the result along with the corresponding values of sucrose, gum arabic and maltodextrin. The symbols in FIG.1 stand for the following. The indigestible dextrin is comparable to maltodextrin in voscosity. This indicates that the indigestible dextrin is usable in foods without entailing a great increase in viscosity. To 10% aqueous solution of indigestible dextrin was added 1% (based on solids) on glycine, and the mixture was heated at 100°C for 150 minutes and checked for changes in the degree of coloration. The results achieved at pH of 4.5 and pH of 6.5 are shown in FIGS.2 and 3, respectively. The same smbols as in FIG.1 were used in these drawings. The indigestible dextrin is not greatly different in the increase of coloration degree from glucose or maltose. This indicates that the indigestible dextrin is usable generally in the same manner as these materials. A 30% aqueous solution of indigestible dextrin was subjected to five repeated freeze-kthaw cycles and then checked for resulting turbidity. FIG.4 shows the result along with the result achieved by maltodextrin. The symbols used in FIG.4 have the same meaning as in FIG.1. The indigestible dextrin is much less than maltodextrin in increases in turbidity and is therefore very suitable for use in frozen foods. FIG.5 shows the result obtained by checking 5 to 30% aqueous solutions of indigestible dextrin for freezing point depression along with the result achieved by sucrose and maltodextrin. The symbols in FIG.5 are the same as in FIG.1. The indigestible dextrin is generally intermediate between sugar and maltodextrin in the degree of freezing point depression and is therefore suited to use in ices and the like. The indigestible dextrin was made anhydrous by drying and then allowed to stand in a constant-humidity container at 20°C and a relative humidity of 81%, 52% or 32% for 200 hours. FIG. 6 shows the hygroscopicity of the indigestible dextrin thus determined. In FIG.6, the results obtained at R.H. 81%, R.H. 52% and R.H. 32% are indicated at (1), (2) and (3), respectively. The water content of the indigestible dextrin will not exceed 18% even if preserved for a long period of time. The indigestible dextrin is therefore suited to use in powdery foods. In the case where the indigestible dextrin was used in place of sucrose, the mix became viscoelastic with a 1.5 minute delay. It was therefore found necessary to lengthen the dough mixing time, to age the dough for a longer period of time or to add the indigestible dextrin during mixing. Examples of foods embodying the invention will be described next. The indigestible dextrin used will be referred to by the number of example in which it was prepared. The amounts of ingredients and dietary fiber are expressed in grams. Flavor Small amt. Small amt. Gelatin Small amt. Small amt. "Emulster #30" listed in Table 54 is a lipophilic modified starch (product of Matsutani Chemical Industry Co., Ltd.). (E) the ratio of the weight average molecular weight of said fraction to the number average molecular weight thereof being at least 25:1. An indigestible dextrin as defined in any one of claims 1 to 2 wherein said fraction that has been separated glucose contains at least 18 %, preferably 18-40 % of dietary fiber and which is including glucose contains at least 7.8 % of dietary fiber, preferably 7.8 to 35.5 %. An indigestible dextrin as defined in any one of claims 1 to 2 wherein said fraction that has been separated glucose is up to 2 kcal/g in caloric value 1 and which is containing glucose is up to 3.11 kcal/g in caloric value 1. An indigestible dextrin as defined in any one of claims 1 to 2 wherein said fraction that has been separated glucose is up to 1.5 kcal/g, preferably 1.5 to 2.0, in caloric value 2 and which in including glucose is up to 2.9 kcal/g, preferably 1.0 to 3.5 in caloric value 2. An indigestible dextrin as defined in any one of claims 1 to 5 which has activity to diminish serum lipids. An indigestible dextrin as defined in any one of claims 1 to 5 as active agent for improving the intestine. An indigestible dextrin as defined in any one of claims 1 to 5 as hypotensive agent. An indigestible dextrin as defined in any one of claims 1 to 5 as active agent for preventing cancer of the large intestine. An indigestible dextrin as defined in any one of claims 1 to 5 as active agent for reducing the insulin secretion. A food containing an indigestible dextrin as defined in any one of claims 1 to 3. A food as defined in claim 11 which is a candy, cake, bakery product, ice, snack, beverage or yogurt. A food as defined in claim 11 which is a soup, mayonnaise, dressing, processed livestock meat product or processed fishery product. A food containing an indigestible dextrin as defined in any one of claims 4 to 10. EP0616776A3 (en) * 1993-03-24 1995-02-22 Matsutani Kagaku Kogyo Kk Feed for domestic fowls.